Mobility is crucial for human development and for the functioning of cities but the automobile may not always be the best solution, especially not in cities where it may have detrimental effects on human health, the environment and development. While evidence of these effects is piling up in a rapidly growing number of academic studies nothing much seems to be done on the ground. Though the following case, from Bangalore, may, perhaps, provide some inspiration. Bangalore is one of India’s biggest and fastest-growing cities. It is also home to the Indian Institute of Science, which was founded by Jamsetji Tata in the early twentieth century. Mr Tata also founded what would later become India’s largest industrial conglomerate, the Tata Group, which includes Tata Motor, the manufacturer of Tata buses and Tata trucks, which are major contributors to road accidents and traffic-related noise and air pollution in Indian cities. Ironically, one of the few places in Bangalore where you won’t find these vehicles is on the campus of the Indian Institute of Science. This is a very green campus with relatively few motor vehicles when compared to the surrounding city. But, as with the rest of the city, the number of cars and two-wheelers are rapidly increasing. To revert this trend, two different projects have been initiated. 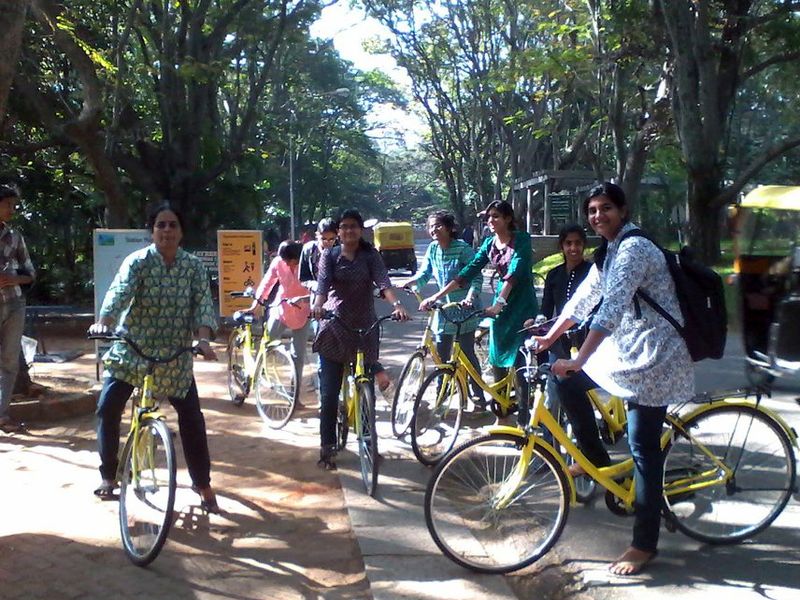 In August 2012, the Namma Cycle service was launched at the campus of the Indian Institute of Science. The idea was conceived 3-4 years earlier by an informal group of bicycle enthusiasts, including Murali H. R., who had been to Paris where he had seen the then newly launched Vélib bicycle sharing system. Initially the group had thought of launching such a service at the Electronic City in Bangalore, but due to the chaotic traffic situation and lack of proper infrastructure it was deemed unsafe there. Therefore the first version of the Namma Cycle service has been implemented at the campus of the Indian Institute of Science. The university had previously tried to implement a similar system, using the bicycles that students would leave behind when they graduated, but without proper management and maintenance people would just abandon the bicycles because of a flat tire or other technical problems and in no time the campus was littered with defunct bicycles. There are two ways of using the Namma Cycle service. One is as a registered user, which cost 100 rupees per month. As a registered user you may use the Namma bicycles as often as you like and each time you use one you get the first half an hour for free. If you use it for longer periods of time you pay 5 rupees for the next half an hour, 10 rupees for the next hour and so on. The other way to use the service is “pay as you go”. In this option you start paying 5 rupees for the first half an hour, 10 rupees for the first hour and so on. The progressive payment scheme is intended to encourage people to return the bicycle as soon as they are no longer using it. When asked about this, Murali says that the idea of bicycle-sharing is “sharing not owning”. The more people who use the same bicycle the better. ‘Namma’, in fact, means ‘ours’ in the local Kannada language. ‘Cycling’ may thus refer to both bicycling and recycling. There are about 3,000 students, faculty members and staff at the Indian Institute of Science, and currently (October 2012) only 65 are registered users of the bicycle sharing service. Nevertheless, during the first two months of operation more than 1,000 trips were made, both by registered and non-registered users, and 70% of these trips were of less than half an hour’s duration. It is hoped that the number of users will increase steadily as the service is improved and students, faculty and staff become familiar with it. This will then enable Namma Cycle to increase the number of available bicycles and bicycle stations in a positive self-reinforcing cycle. The software used for registration and to keep track of the bicycles, has been developed by Gubbi Labs and is intended as an open source software that can be used free of charge by similar services in other places. In fact, the initiative at the Indian Institute of Science can be seen as a pilot project, which may be implemented in other campuses and at a larger city-scale. But for such a service to work citywide city administrations need to provide safe spaces for bicycling. The City of Bangalore recently launched another bicycle sharing service with a few small stations located at the new metro stations, but as there are no safe bicycle lanes around the stations, and very few bicycle stations in the city, this service is hardly used at all. In addition to the Namma Cycle service, the Indian Institute of Science is also planning to implement an E-Mobility service based on extra-large electric golf carts that will shuttle along designated routes on its campus. According to Gururaja K.V., a member of the group who is designing the project at the Center for Infrastructure, Sustainable Transport and Urban Planning, the inspiration comes from a similar service at the historical city of Hampi but it is also being used at Infosys’ high-tech campus in Mysore. The E-Mobility project seeks to address growing concerns over the increasing numbers of motor vehicles entering campus each day. Today, motor vehicles account for about 50% of all trips on campus while walking and bicycling make up the other 50%. Surveys indicate that even though a significant number of campus trips (1/3) are made by non-campus residents who enter through one of the four main gates of campus, most trips (2/3) are made by campus residents between the areas where student’s hostels and staff quarters are located and certain clusters of department buildings and common facilities like the canteen and library. Peak hours are indentified in the morning, around lunch and in the afternoon/evening. The fact that demand is not equally distributed over space or time constitutes a classic dilemma of transport planning and solutions will often result in either insufficient or excessive capacity. More complex operation schedules with differentiated frequency for different time periods and different routes, and integration of the bicycle sharing service, may help solve this dilemma. Switching from (private) vehicles running on gasoline or diesel to (public) vehicles running on electricity will reduce both air and noise pollution on campus. It will, however, not reduce overall greenhouse gas emissions if the electricity comes from the national grid because most of the electricity in India is produced by coal, which makes electrical vehicles potentially more harmful to the global environment than traditional motor vehicles. Therefore it is hoped that solar panels can be installed on the roofs of the e-vehicles to make them self-sufficient with low emission electricity. Gururaja says that the aim of the E-Mobility project is to make campus free of polluting vehicles within the “next few years”. To achieve this, the E-Mobility and the Namma Cycle services must be seen as complementary rather than competing services and should ideally be planned and managed by the same entities. This may yield considerable operational benefits and make the services more user-friendly while expanding reach and increasing connectivity. It may also help solve the capacity dilemma. Bicycles may, for instance, provide an alternative to e-vehicles during peak hours and be used to reach locations that are not served by E-Mobility while the e-vehicles may be a convenient alternative to the bicycle when it is raining or one is feeling lazy. Surveys indicate that the majority of potential users are willing to pay the proposed fare of five rupees per trip, which should be enough to cover operational costs. Capital costs, of which the investment in e-vehicles is by far the largest, may be (partly) recuperated through sponsoring and income from advertizing. 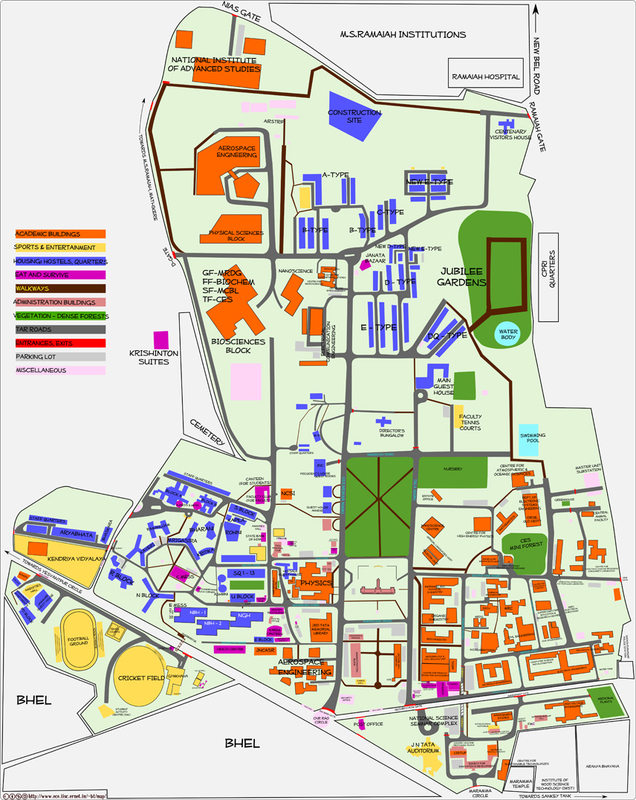 Parking facilities for motor vehicles will have to be constructed at the four main gates of campus, but this may happen in a later phase. In the first phase a single e-vehicle will be operated to test the system and provide user feedback. The planning of the e-mobility routes must obviously adapt to the existing situation but how these routes are planned may play an important role in how campus will develop in the future as new facilities and activities will probably try to locate close to this service. E-mobility – if well planned – may therefore not only help make campus “greener” but also help preserve existing green spaces! Namma Cycle stations and E-Mobility stops have to be strategically placed around campus and in the immediate vicinity of the parking lots at the four main gates of campus. E-vehicles should be solar powered and a pollution-free system for deliveries and garbage collection on campus has to be invented. With such an integrated solution, implemented in phases as an ongoing learning process (appropriate for a university! ), the campus of the Indian Institute of Science may become a great example of how to create healthy urban environments for human development!